The other day I was re-arranging some stuff in my drawer when I discovered an old stack of dusty comic books. One of them happened to be good ol' Tinkle -- mother to beloved desi toons like Kaalia-The Crow and Shikari Shambu. While browsing through its pages, I stumbled upon an illustrated educational strip on Sarus Cranes and their hilarious courtship dance, which suffice to say, involved a whole lot of hop, skip and hurdle. It was straight out of a Bollywood movie. I couldn't help drawing parallels between Jeetendra [Images] and Aruna Irani's leap 'n' flap styled shimmy in the spy thriller, Farz. Despite the silliness of it, I couldn't help but find myself inexplicably entertained. Perhaps it was owing to the kind of novelty Jeetendra had to offer. In fact, the Humjoli hero, before demonstrating occasional brilliance in Gulzar-helmed dramas like Parichay, Kinara and Khusbhoo, benefited immensely from his freewheeling jig. His son, Tusshar, technically, might be a better dancer but well-disciplined, co-ordinated moves hardly strike as ingenious when all his peers are doing/dancing exactly the same. For a long time, every actor had his own style, around which the choreographer worked and improvised. Be it Kishore Kumar, Shammi Kapoor, Amitabh Bachchan [Images], Rishi Kapoor [Images], Mithun Chakravarthy or Anil Kapoor [Images] -- they all danced to their own tunes and trademarks. For God's sake, even Shashi Kapoor, the last guy you would associate with rock 'n' roll, could brag of his own inimitable shoulder juggle. As for the ladies, their ability to dance has always been given the same importance as their capability to act. From Sandhya, Waheeda Rehman [Images], Vyjayanthimala [Images] and Helen to Hema Malini [Images], Sridevi [Images], Madhuri Dixit [Images] and Aishwarya Rai [Images], the list is extensive but emphasises on the continuous existence of dancing talent within the film industry. While there is no dearth of good dancers within the industry, the depiction of this form, in its own, has taken a disappointing turn. Dance in Hindi films, these days, is synonymous with item numbers, promotional videos, starry appearances and lavish sets. Sure, I enjoyed Kajra re (Bunty Aur Babli [Images]) and It's rocking (Kya Love Story Hai), but if special items are induced as a regular fare on the menu, the whole idea of USP seems futile. Also, a sort of monotony has set in. I mean how many different ways can one gesture Yo! anyway? Be it Abhishek Bachchan [Images], Shah Rukh Khan [Images] or Akshay Kumar [Images], no doubt, meticulous performers but they all are gyrating around familiar movements. 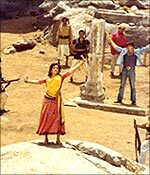 On the other hand, Vyjyanthimala's classical triumph in Hoton pe aisi baat (Jewel Thief), Waheeda Rehman's poetic agony in Rangeela [Images] re (Prem Pujari) Amitabh Bachchan's iconic hand/foot work in Jahan teri yeh nazar hai (Kaalia), Madhuri Dixit's infectious thumkas in Ek do teen (Tezaab), Aishwarya's dazzling perfection in Nimbooda (Hum Dil De Chuke Sanam), Hrithik Roshan's [Images] nimble actions in Ek pal ka jeena (Kaho Naa... Pyaar Hai), to name a few, each of these performances had something dramatically individualistic and inarguably sensational about them, which bears fond and hard-to-erase memories in the minds of their viewer. As much as I enjoy Hrithik's rocking acrobatics, it gives me strange relief to witness him spin to a divine trance around the chants of Khwaja mere khwaja (Jodhaa Akbar). It's a masterful touch -- subtle, relevant and most poignant. It's a hopeful indication, in the times of item choreography, that not all art is regulated by the economics of movie-making. If only creativity, currently defined through attitude and show, reflected this dramatic vision and groundbreaking originality! Somewhere along the line, after constantly being fed on a diet of repetition (read blowing punches in air, thrusting pelvics, violent body movements), we-the audience, has trepidly accepted the fate or fall of choreography. Dance is about passion and precision, expression with technique, dedication laced with innovation. And so it's quite a pity when a film like Aaja Nachle, which revolves around the same, wastes a God-sent opportunity of changing the course of choreography. It isn't awful at anytime. But not nearly breathtaking to make your jaw drop in awe, despite the inspiring presence of Madhuri. Interestingly, another dance-related subject -- Dil To Pagal Hai, again from the Yash Raj stable, which employed the imaginative services of Shiamak Davar -- challenges the true potential of Madhuri's calibre, and that results in a marvelous turn for the actress. Remember the exhilirating Dance of Envy where Karisma Kapoor and she strive to outshine the other to the best of their abilities? Another time the 40-plus actress showed her mettle as a competitor par excellence was during her dynamic session with Aishwarya in Dola re, Devdas. The mathematics of grandeur and gimmickry in choreography isn't always a bad thing. In some cases -- like the opulent Azeem-o-shah Shahenshah (Jodhaa Akbar) and SFX-generated Dhoom tanna (Om Shanti Om) -- it works wonderfully. Otherwise, it fails to register beyond its deliberate sleekness. And while I am all for tersely woven plots and understand the need for some subjects to do away with such distractions in order to sustain its realism, I confess: I love the presence of songs and dances in our movies and the identity and individuality it renders to our cinema. At the same time, I ache for the drama and conviction in its presence. I am nauseated of watching skimpily clad women breaking into vigorous numbers against a brightly lit backdrop at the end credits for no real rhyme or reason. I am bored of watching men-in-shiny-pants jiggle and joggle with alarming uniformity. I am tired of watching re-runs of desi-fied videos of Justin Timberlake [Images] and Britney Spears [Images] in the name of dancing. I miss an uncomfortably tied Dharmendra [Images] screaming on the top of his voice Basanti, in kutto ke saamne mat nachna, the usually hyper-chatty Ms B, ignores his pleas, and lets her feet do all the talking, atop pointy glass pieces, no less. It's high-time Bollywood played Gabbar Singh's favourite request -- Naach Basanti Naach.